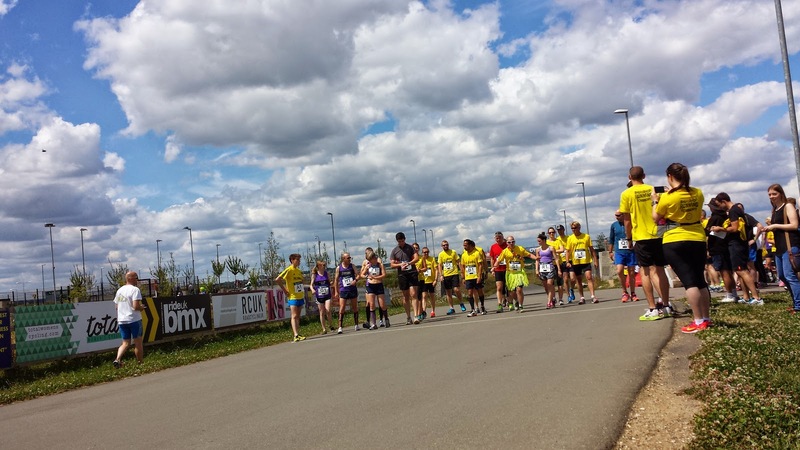 On 29 June 2014, Sweatshop held a running event at the Cyclopark, near Gravesend in Kent. 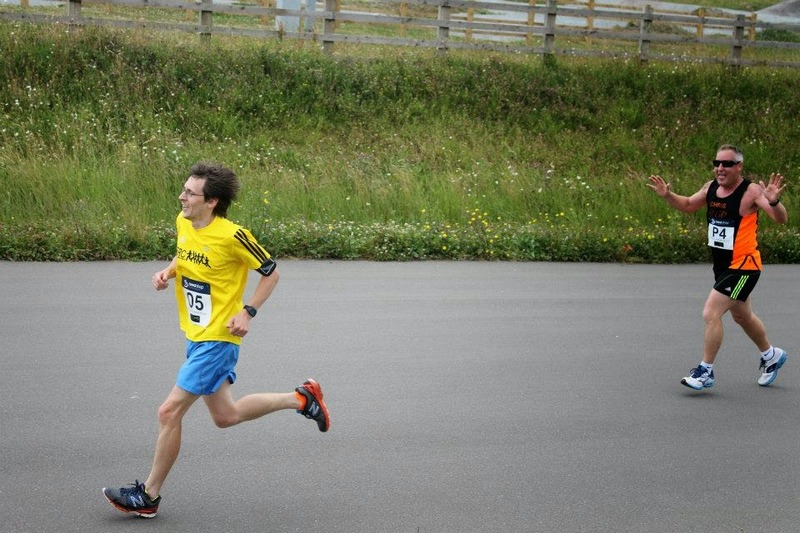 Rather than just putting on a bog-standard race, they decided to make it a relay race. The plan was for it to be a 5 x 5km event. However, on the day, there was some kind of mix up with the bookings on the track and we lost a 400 metre section of the track. As the 5km would have been made up of two laps, it meant that the 5 x 5km turned into a 5 x 4.2km relay. 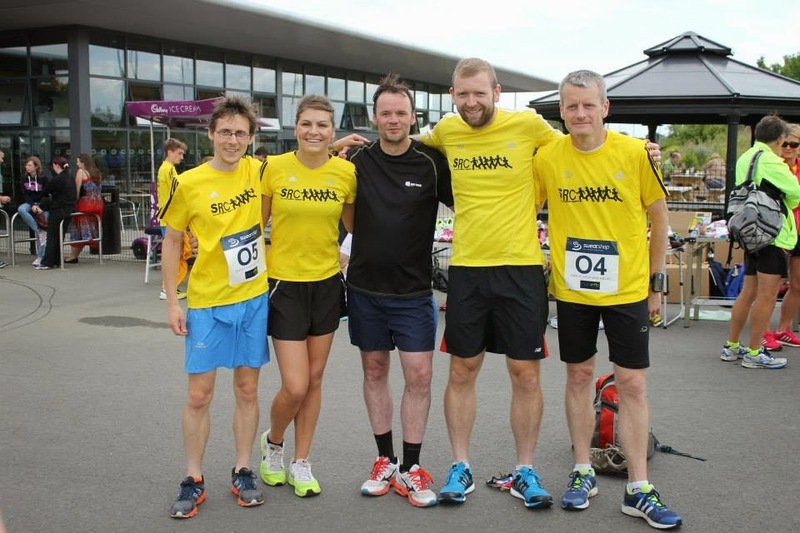 The entry fee was £25 per team, so we paid our £5 each and collected our race bibs - I was running in one of Bluewater Sweatshop's teams (sweatshop src 4) and we had been allocated team O. The bibs were marked with the team letter and then the runners' individual number. The number referred to what leg of the race each person would run. The team decided that I should run the fifth and final leg, so I was handed the O5 bib. plus one other team with no name. The event was taking place in the afternoon and there was a really good turnout of runners and their families. The cyclopark has a playground to keep the children occupied, plus it has a cafe and toilets all located in the main building at the entrance. At some point just after 12 o'clock, the teams gathered next to the track for a briefing. Once done, all of the teams' first runners headed onto the track to get the race underway. As I was the fifth runner to go, I would have a wait of over an hour before it was my turn to run the two lap course. In the meantime, there was plenty of banter between the teams on the sideline. As time went by, each of my fellow team members were called into action to put in their best effort around the track. First it was Dave Tyler, then Jodie Rawlinson, Lee Edwards, Simon Hassett, and then it was my turn. With the team counting on me to do my best, I started at an aggressive pace. As the track weaves its way away from the crowd, things become much quieter and even a little lonely at times. The wind around the back of the course was blowing. Not too much, but enough to wish it would stop. Then of course there's the uphill section at the end of each lap. But the support from the other runners was fantastic coming up the final incline and into the start/finish area. Once I had completed my leg of the race, I took a few moments to recover, then resumed my position at the side to encourage the other teams' remaining runners. Not too long after, all the runners were back and the race was over. The results were soon ready and the Sweatshop organisers held a little presentation ceremony where spot prizes were awarded and lastly the winners were presented with their trophy. The full results were posted online. We finished in a total time of 1.25.37, only 4.8 seconds in front of the next team. I was pleased to see that our team had finished in 4th position overall. It also worked out that we were the top placed of the 9 Bluewater teams. I'm very proud to have run with such a fantastic team - thanks for having me. Looking at and analysing my own time, if each leg had been the full 5k, I may well have been on for a new 5k personal best. My overall average pace was 3.39 per kilometre (5.52 per mile), which if I could have maintained for a full 5k would have given me an 18.15 finishing time. 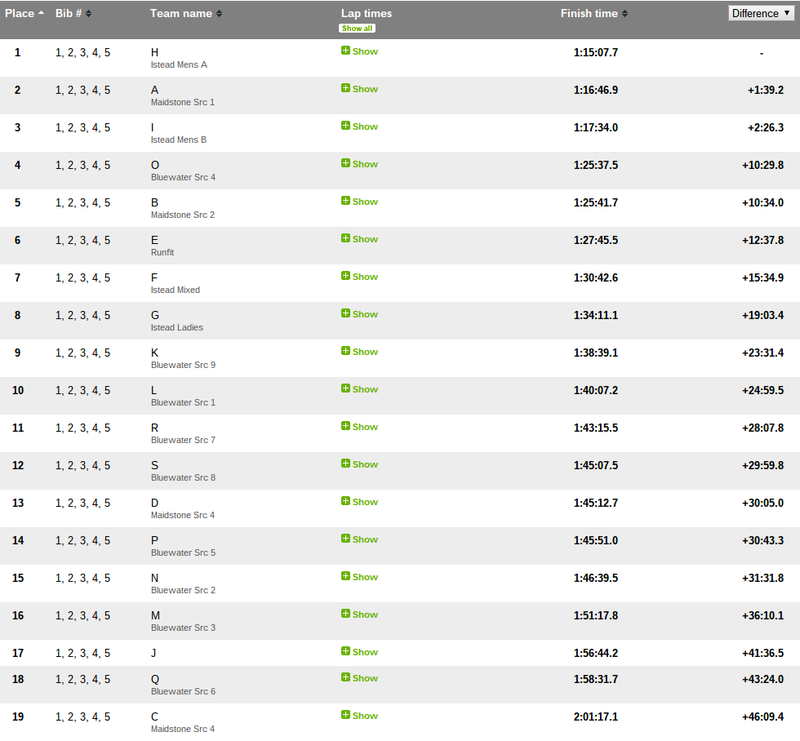 According to my gps data on Strava, I set new best times for half mile, 1km, 1 mile, and 2 miles during the race. Not a bad afternoon's work at all. Just as the presentation ceremony had finished, the rain started to fall. I think everyone agreed that the rain couldn't have timed itself any better. It was a great little event, which we were promised would be bigger and better next year. I can't wait!